No matter which show I watch: Bar Rescue, Restaurant Impossible, Tabitha’s Salon Takeover, and even the long gone but much loved We Mean Business (hosted by Apprentice winner Bill Rancic), there is one common element: every single business that the hosts enter is FILTHY! The aforementioned shows are my soap operas; I simply can’t get enough of them. I love peering into other people’s businesses and seeing how they’re run and what sets them apart. There’s one thing that consistently horrifies and bemuses me: the cleanliness of the business. Every entrepreneur knows what it’s like to have to scrimp and save, but cleaning costs you absolutely nothing and it can make all the difference in the world. The worst place to find filth has to be in a restaurant, especially if you don’t figure out the place is filthy until after you’ve already finished your meal. 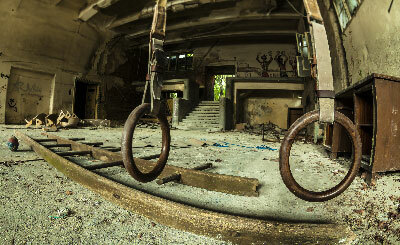 I would argue that the second worst place to find filth is in your gym! If your gym has a restaurant or juice bar in it you get a double whammy. Have you ever heard of Methicillin-resistant Staphylococcus aureus (MRSA)? Please trust me when I tell you that you don’t want to hear about it from one of your members or from an attorney. MRSA (Staph) infections are becoming increasingly common in athletes and in athletic settings, including gyms! MRSA fear is a good reason to keep your gym spotless but an even more immediate reason is money. If your gym is dirty, your equipment is poorly maintained, or there are odd smells in your gym you will have a money problem. Even if your members don’t realize it immediately (and many don’t), they will subconsciously be put off by the state of your business. When your customers are put off, either consciously or unconsciously they will spend their money elsewhere. There is simply no excuse why your business shouldn’t be spotless. If you wouldn’t feel 100% comfortable walking around your business barefoot (including the bathrooms and showers) you have a big cleanliness problem. If you’re paying attention, you’ll notice the moment you walk into a business whether or not the owner values cleanliness. Your customers are willing to forgive you for a lot of things including a small facility, or old equipment, but they will never forgive you for an unclean or unsanitary workout environment. I’m harping on this because this is the low hanging fruit. No matter your resources or your budget, you can improve the cleanliness of your gym today and I promise that your members will notice. Keeping your business clean is easy once you institutionalize cleanliness as a policy. 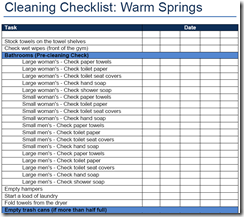 Start by creating a cleaning checklist for your business. 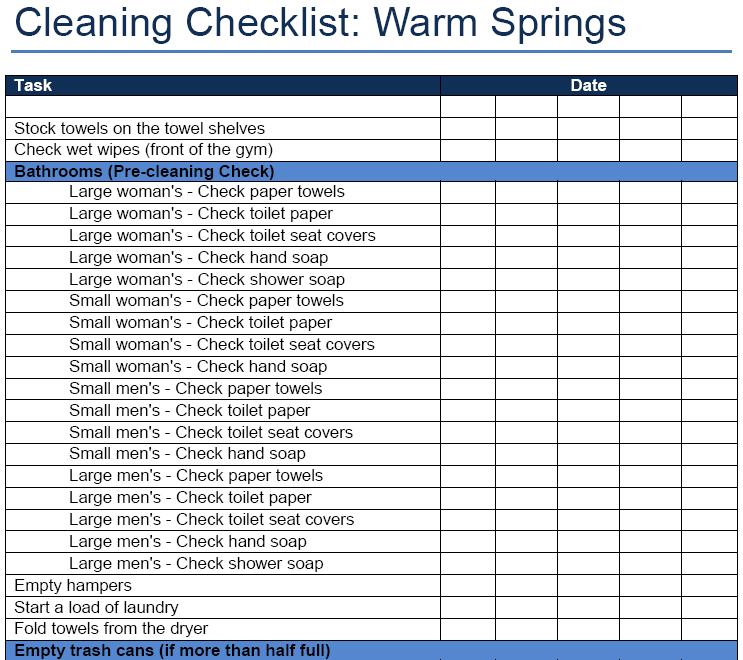 The columns of your checklist should represent days of the week and the rows of your checklist should represent items to clean or specific cleaning actions (such as ‘vacuum all floor mats’). Once you have a checklist, make sure that your staff follows the check list every single day. After your staff gets the hang of utilizing the checklists, then start performing random audits of their work. Take a checklist and randomly highlight 5-10 rows and do a walk-through with the person who is responsible for the list. For each item that you highlighted, give it a score (A-F) and when you’re done, write the cumulative score on top of the checklist. By doing random walk-throughs with your cleaning staff, they will learn how you like things cleaned and which items are of the highest priority. Every single television show that I mentioned starts with an evaluation and after the evaluation is complete the next step is always cleaning! Create your cleaning checklist today and start enforcing it immediately. Your members with thank you and your competition will hate you for it. i hate when any business i visit is dirty especially the gym! c’mon! Thanks for providing an insight on who important it is to keep you GYM premise clean. We here at Keen to Clean also promote cleaning of gym on regular bases. As Everyone knows the key to a healthy body is keeping to regular fitness and health routines. This is the same approach of Keen to Clean to keep a healthy gym environment for your customers to work out in. Having a proper check list is also important we make tailor made check list for each and every premise according to clients requirements.